3) On the next screen you have your configuration of chess pieces on the right, and their movement patterns on the left with small icons denoting. For example, the knight is the small horse. 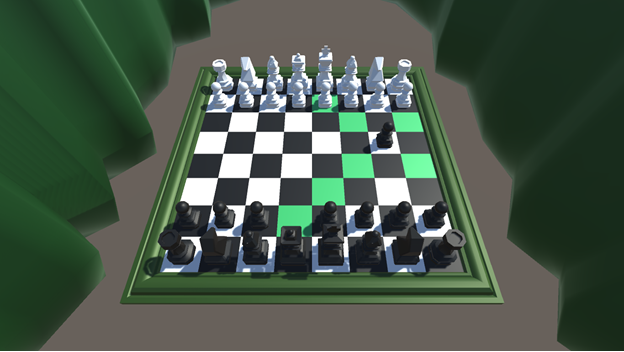 On this screen, please choose which pieces you want to have which movement patterns, (no peeking Black Piece Player!). If you want the knight piece to have the rook movement, press the small castle icon, then press the knight model, and so on, until all of them are changed. Remember which movements you picked for which icons! Then press play. 5) Play the game! White goes first, (as is customary). When capturing a piece, press the SQUARE that the victim is on, NOT the doomed piece. Check does not exist in Cloak and Dagger, so be sneaky, and protective of your king. One player wins when they kill the other player's king.